"I love these in a restaurant so when I make them at home I try to make them a little healthier." Bake potatoes in preheated oven until easily pierced with a fork, about 1 hour. Allow to cool for 10 minutes. Do not turn off oven. Meanwhile, cook bacon in a large deep skillet over medium-high heat until evenly browned. Drain, crumble, and set aside. Slice potatoes in half lengthwise and scoop flesh into a large bowl; save skins. Mix in sour cream, milk, salt, pepper, 1/2 cup Cheddar cheese, and half the green onions into potato flesh. Blend with a hand mixer until creamy. Spoon potato mixture into potato skins. Top each with remaining 1/2 cup Cheddar cheese, 4 sliced green onions, and bacon. Bake in oven until filling is hot and cheese is melted, about 15 minutes. See how to make creamy twice-baked potatoes with cheese and bacon. 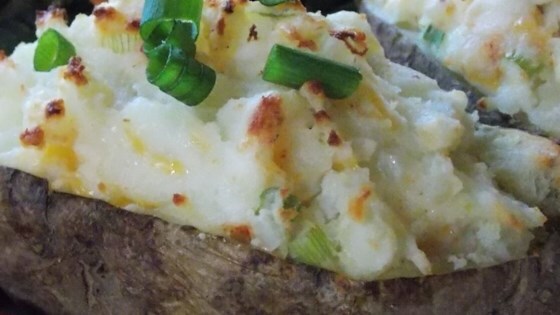 This recipe is a healthier version of Ultimate Twice Baked Potatoes. I reduced light sour cream by half, so I could have some light butter & used 2% Cheddar cheese. Yum. Might use turkey bacon, next time. Very yummy! It's easy to reduce calories and fat even more by using less bacon and cheese. My trick for refilling potatoes is to use a cookie scoop. Easy peasy! These were very easy to make and my husband didn't even notice the difference between the yogurt and sour cream!